Reading Well Mood Boosting Books is a national promotion of uplifting titles, including novels, poetry and non-fiction. The books are all recommended by readers and reading groups and are perfect when you’re in need of a boost. Visit your local library to pick up a reading well mood-boosting book today. The books are available for anyone to access from their local library for free. Friendly staff will be on hand to help you join the library if you are not already a member and to find the book that’s right for you. GPs and other health professional may also recommend titles. Reading Well for mental health provides information and support for people with common mental health needs and for dealing with difficult feelings and experiences. The books are all endorsed by health experts, as well as people with personal experience of mental health conditions. The books include information on approaches such as CBT and mindfulness, as well as common mental health conditions including depression anxiety, OCD and others. The collection also includes personal stories and advice for carers. Download the full book list. 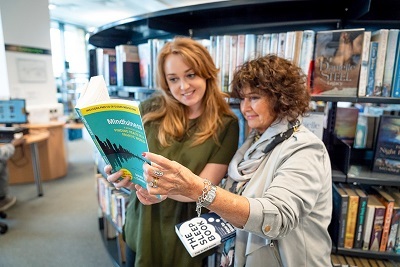 Reading Well Books on Prescription for dementia recommends books you might find helpful if you have dementia, are caring for someone with dementia, or want to find out more about the condition. The books include information and advice, help after diagnosis, practical support for carers and personal stories. The books are endorsed by health experts. Shelf Help recommends books that provide helpful information and step-by-step techniques for managing common mental health issues for 13-18 year olds including anxiety, depression, eating disorders and self-harm. Some of the books follow a self-help approach based on Cognitive Behavioural Therapy (CBT). Many of them include practical, step-by-step activities to help with common mental health issues like stress and depression. There are also fiction titles within the collection with themes covering mental health. The books are endorsed by health professionals. Reading Well for people with long term conditions is a collection of books that provides information and support for people living with a long term health condition and their carers. The books provide quality-assured information about common conditions and symptoms, practical advice for living with a long term condition and support for self-management. For more information please visit our health information page.